Hi folks, today I’m slacking off and generally being very lazy. Fear not though – I’ve asked my dear wife to step in and fill in for me though with a well-loved Swedish dish! Different nationalities will know these, or something similar, by other names, but for Swedes they are “raggmunkar”, and they’re awesome! I’ll waste no time at all in leaving you in her capable hands, but I felt I must first mention that this isn’t the most photogenic dish… hopefully you’ll trust me when I say they’re delicious, and if you don’t have confidence in me then perhaps you’ll trust the opinion of my son whose hand you can see sneaking into the photo down below! So, as the saying goes; behind every food blogger, there’s a neglected spouse eating cold but perfectly styled food. That’s not quite the case here though. As luck would have it, I too love food. When growing up my father was a chef and restaurant owner and if my childhood home didn’t smell of sweet tomato sauce and grilled vegetables, then it was just because there was bread raising on the kitchen counter or fish being cleaned over the sink. Later on Charles would woo me with similar dishes; spicy and flavourful, cooked to perfection. Yes, the food Charles cooks is indeed as tasty as it looks. Yes, he does wash up. (In fact, he’s one of those people who can’t go to bed if there’s a dirty plate in the sink.) And, yes, he does let me cook sometimes. People always ask me this question, some even sounding quite concerned, and I always wonder if they’d still be wondering if our gender roles were reversed? My food is often met with high praise such as “filling”, “perfectly edible” and, on occasion, “with a few twists, it would be quite good”. My high claim to fame is that nothing goes in the trash; whether this can be attributed to food quality or both of us having been raised by parents who don’t believe in food waste, I’ll leave up to you. Anyway, it’s with great interest — and a bit of pride — that I’ve watched his blog grow. I’ve read every comment and, in a way, feel like I’ve gotten to know a lot of the ‘regulars’. And so, even though I’m not a blogger, I’ve finally given in to Charlie’s request that I write up a post for him. Now that you’re all really tempted to try out one of “my” recipes, here we go! Mix the salt and flour in a large bowl, then add half the milk. Whisk until smooth before adding the rest of the milk and the egg. 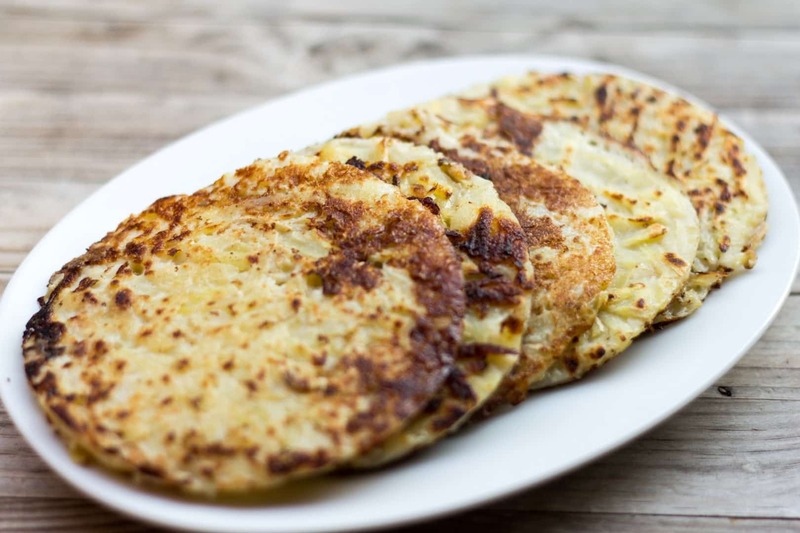 Peel and grate the potatoes, then mix in with the batter. Melt some butter in the pan, then place some batter into the pan as you would with regular pancake. (4 slightly heaped tbsps of batter for each pancake is a good "rule"). Press the pancakes down so they're quite flat, and when well done on one side, flip and cook on the other side. They should be brown and a little bit crispy on the edges. While ideally served with a tart lingonberry jam. a grated carrot salad and bacon, you can also enjoy these with other savoury toppings which are more local to you. 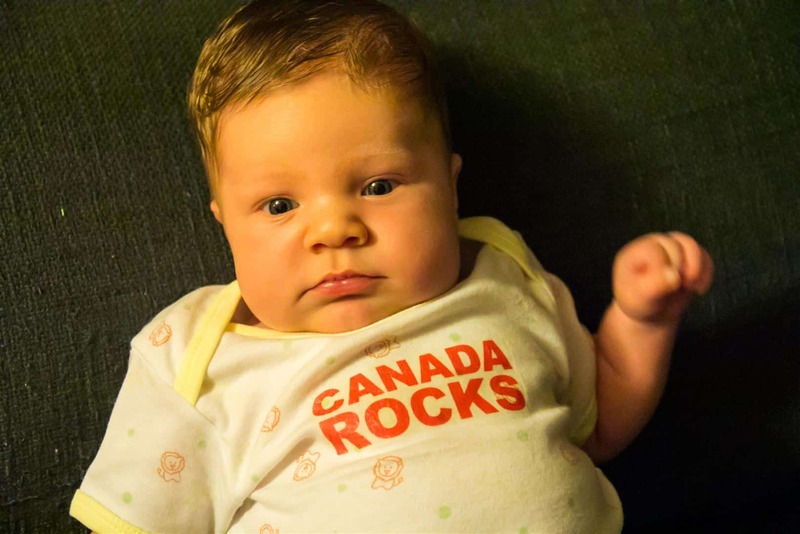 Greetings folks – I’ve gone Canadian for this post! I’ve got a great guest poster standing in for me today, and in honour of her post I thought I’d post a little photo of William as well. The very latest in Canadian baby fashion (look how cool he is! ), this, and a couple of other adorable little outfits, were sent to me by the lovely Barb, from Profiteroles and Ponytails, and Eva, from Kitchen Inspirations, when they first found out my wife was pregnant. Can you believe that this little outfit is supposed to be from 3-6 months? Little Will is rocking it already… chubby little guy that he is! I can see that he’s going to cause us no end of expense in clothes shopping in the future, when he’s growing out of shoes in two months flat! Speaking of Barb, she very kindly offered to write this guest post for me – even after I was planning on returning to more regular blog work. Naturally I jumped on the offer, because it’s always wonderful to have those precious extra moments free which I can spend with my family. I first met Barb through Eva’s blog about a year ago and since then have greatly enjoyed her recipes and stories. For those of you who don’t know her, she has two adorable children (the ponytails), who pop up every now and again on her blog. She’s making something amazing today which I’ve never dared to try to make myself (despite buying equipment just for these once) – they look absolutely amazing, and I do hope you all enjoy the post – thank you once again Barb – now over to you! I started blogging because I needed a creative outlet for my obsession—one that would save me from driving my friends and family crazy with my incessant “food talk”. Turns out though, the aspect of blogging I enjoy the most is being part of this amazing international community of food lovers—it is such a constant source of inspiration and knowledge. Inspiration works in mysterious ways. You see something that speaks to you . . . and then you tuck it away until the time is right. A few months back I commented on the lovely background that Charles used in one his photos (Calissons) and he told me that it was in fact a macaron mat. I thought that was very cool and it made me want to try to make macarons. Then when Charles mentioned writing a guest post, it hit me. This was the perfect occasion to give macarons a try. What better way to celebrate international friendships and the new little bundle keeping Charles and his wife very busy? It seemed like such a good idea at first. Why not make something that would bring a little piece of Paris to those of us scattered around the globe who follow Five Euro Foods? Then I started my research and I was completely overwhelmed by the macaron “lingo” that I wasn’t aware existed. My mind was spinning as I learned about the importance of “feet,” macronage* . . . and “aging” egg whites**. The more I read, the more frightened I became. Can you spot the “feet” in this photo? I came very close to scrapping the macarons and making something else. But then I decided to give them a try because it would be a good opportunity to share my experience—and if I’m lucky, some of you will share your tips and experience with making this legendary French confectionery. It would be great to learn more. Isn’t that what blogging is all about? I think it is. And so is this . 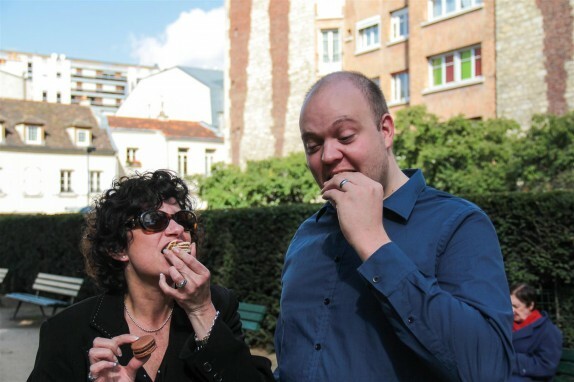 . .
Eva and Charles getting to know one another — and the macarons of Paris — a little better! A large pastry bag fitted with a 3/8-inch plain tip or a qt-size sealable plastic bag with a corner snipped off, plus another sealable bag for curd. 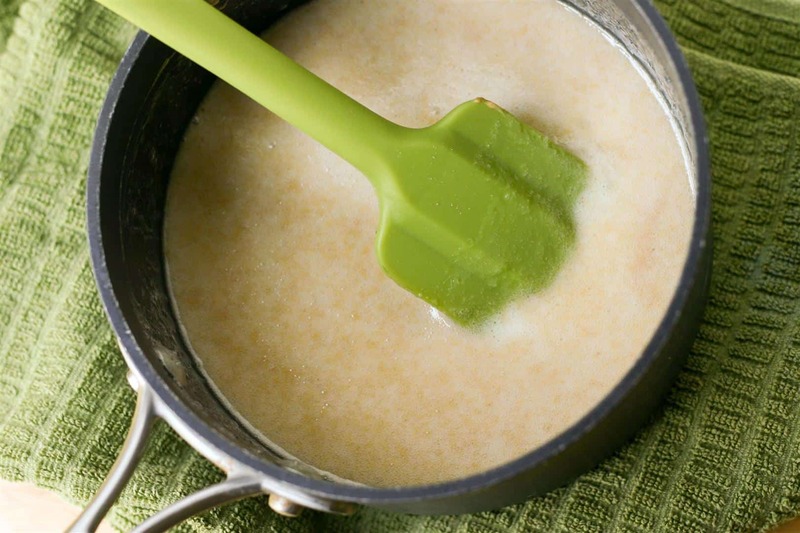 – Whisk together lime juice, sugar, and egg yolks in a small heavy saucepan. Add butter and bring to a simmer over medium-low heat, whisking constantly, until curd is thick, 4 to 5 minutes. Cool completely and refrigerate for a couple hours before using. – Line 2 large baking sheets with parchment paper. – Grind coconut and almond flour or almonds with confectioners sugar in food processor until powdery, about 2 minutes. (If using grinder, grind in small batches.) Sift through a medium-mesh sieve into a bowl (if not fine enough for almost all of nuts to go through sieve, regrind). Sift again into a large bowl. 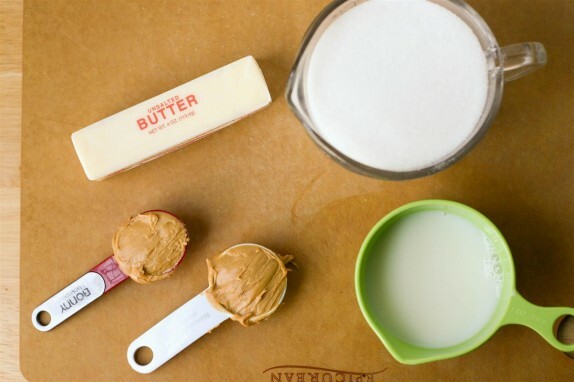 – Put small dabs of batter under corners of parchment to secure to baking sheets. – Spoon half of batter into pastry bag. Holding bag vertically just above baking sheet, pipe 1-1/2-inch-wide mounds of batter about 1 inch apart, stopping pressure and flicking tip sideways to avoid peaks (tamp down any peaks with a wet finger). Refill pastry bag and repeat. 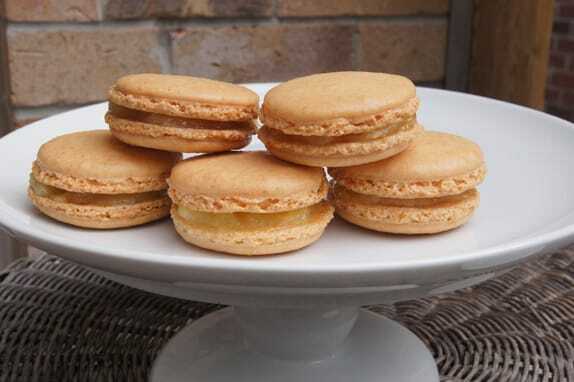 – Let macarons stand, uncovered, at room temperature until a light crust forms, 20 to 30 minutes. – Meanwhile, preheat oven to 300°F/150°C with racks in upper and lower thirds. 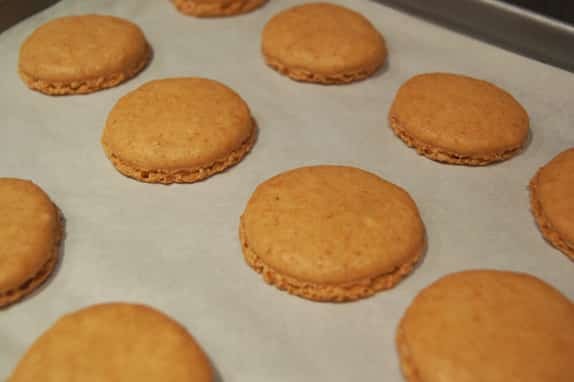 – Bake macarons, switching position of sheets halfway through, until crisp and interior does not give easily when a macaron is gently pressed, 22 to 28 minutes total. (I found they needed much less time to cook. I cooked mine for 20 minutes and next time I will check them even sooner.) Cool completely on baking sheets (for residual heat to harden bottoms) on racks, about 30 minutes. Loosen macarons from parchment with offset spatula (they will be fragile). – Pipe about 1/2 tsp or so of curd onto flat side of half of a macaron, then sandwich with a remaining macaron. 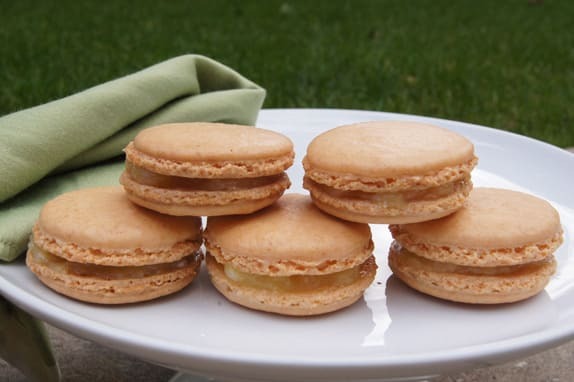 – Layer macarons between sheets of parchment in an airtight container and let stand at room temperature at least 2 hours to soften before eating. I didn’t put the shells into the fridge to store — I just stored them (unassembled) in a container. I think this was a mistake, as they seemed to harden a bit the next day. The changes that I made to the Gourmet recipe were to use “aged” egg whites and to use a lime curd instead of the passion-fruit curd in the original recipe. I also didn’t use any food colouring. 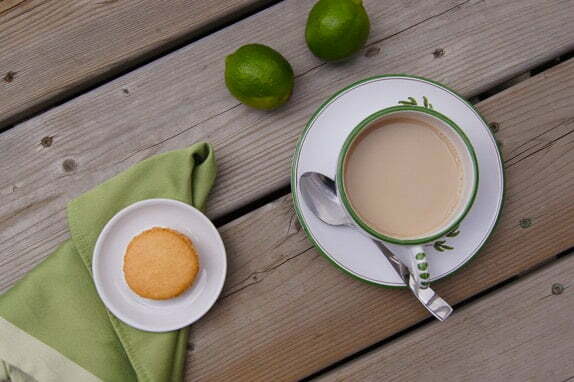 I think coconut and lime is a sublime flavour combination. I hope you agree. I also used nutella in place of the lime curd for some of the macarons. The ponytails loved both options. I used icing sugar because confectioners sugar is rather hard to find. However, the experts recommend that you use confectioners sugar because icing sugar (also known as icing mixture) contains corn starch which impacts the final form and texture of the macarons. I didn’t use a macaron mat because, well, I couldn’t find one. Next time I will draw 1-1/2 inch circles on the back of the parchment paper to ensure each cookie is a consistent size. * Macronage – the process of mixing of the nuts and sugar mixture into the egg whites. ** Aging egg whites – means to separate the yolks from whites and store the whites (covered) in the fridge for 24 hours. The whites should be brought to room temperature before using. The reason is to reduce the moisture content as much as possible. It is such an exciting time for Charles, as he starts this new journey into fatherhood. Little William is a lucky boy, as I have no doubt that Charles will apply the same enthusiasm and passion towards his new role that he does many of his other endeavors – particularly FiveEuroFood! Congratulations again Charles! I’ve been following her blog for quite some months now and strongly recommend it to those who aren’t familiar with it. She makes a lot of videos of her recipes – seriously, I thought I was doing ok with ~60 uploads, but she’s well above 100 by now. Thanks to her bubbly, friendly on-screen presence, each video is a real joy to watch so really, go go – check it out :). Thanks for this delicious, and fascinating, looking post today Angela – you’ve given this tired daddy that extra bit of valuable time which I can spend with my new family and not have to worry so much about finding something to prepare in the kitchen! My name is Angela and my friends call me The Squishy Monster. I’m a first generation Korean American and my food reflects this about me. I like to showcase my food, whether it be baking or fresh Kimchi on my blog and cooking channel. There you’ll discover that it’s all about “Cupcakes to Traditional Korean Food and Everything in Between! There’s something about the farm to table approach that makes food taste that much better. Maybe it’s that you’re able to really appreciate where it all comes from, maybe it’s the old adage of working for what you eat, maybe it’s all in the fun of gathering what’s good to eat to share and enjoy…maybe it’s a lot of things but Pops has always been into growing his own food since it was practically necessary in Korea where it was just as commonplace to grow your own food in the backyard as it was to duck into a chain market to pick up a sack of greens. 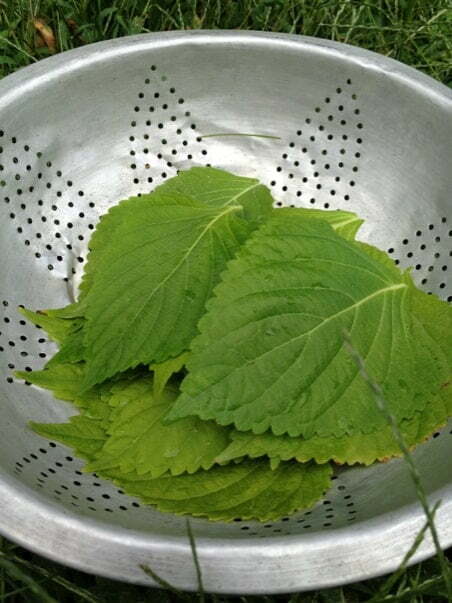 These are Daddy’s bright, emerald Perilla leaves that grow in abundance in our backyard. 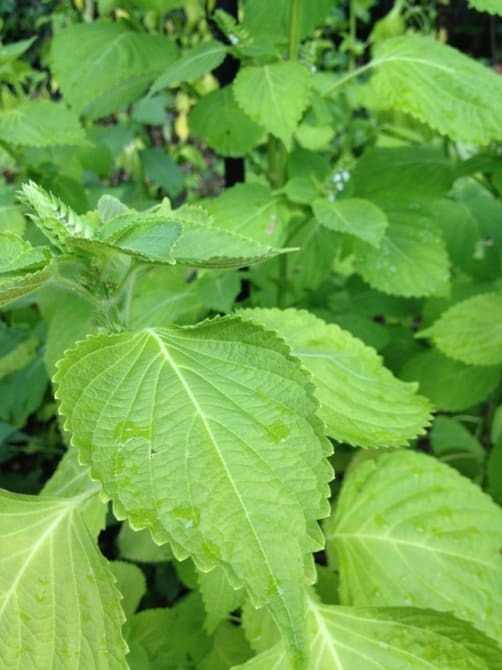 Perilla (Sesame) leaves are very popular in Korean cuisine. They are an herb from the Mint family and to me, they have a very strong taste (chock full of essential oils) and remind me of a cross between Mint/Basil and Anise/Licorice. 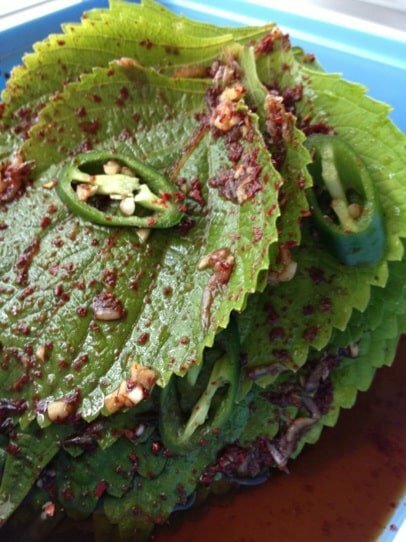 They intensify in flavor when crushed (Mama likes them in savory Korean Pancakes and prefers them as “Ggaennip Kimchi”). Daddy likes them dipped in batter and deep fried (yum)! Perilla leaves are also high in Vitamin C and Calcium. With the exception of your peppers, whisk everything else together and spread generous spoonfuls of your “sauce” on top of each leaf and press a fresh one on top of the previous one and repeat. Garnish with Peppers ,Green Onions, and/or Sesame Seeds. Press your leaves together and turn them over a few times. 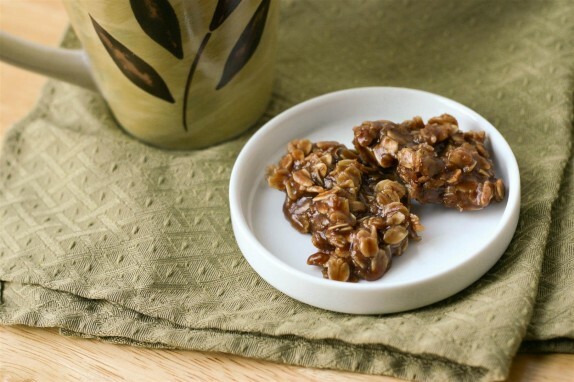 Leave them on your counter at room temperature for about 3-4 hours before refrigerating. They will deepen in color and wilt beautifully so they lend themselves very well as rice wraps. They are ready to eat in just a few days. 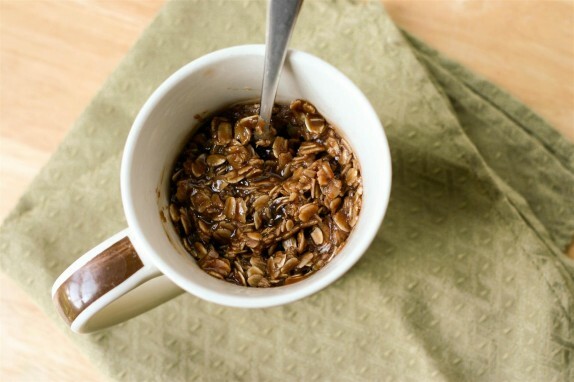 Economical, quick, easy, and delicious! Greetings everyone, finishing up my guest posts today I have Kristy from Eat, Play, Love. Well, actually, that’s not entirely true. Actually Kristy often has her two adorable children, and sometimes even her husband helping out in the kitchen, which usually makes for a whole load of fun and lots of cute photo opportunities! Kristy and her husband, Mike, have a wonderful way of introducing their kids to new foods. They pick different countries and sample the cooking from each place they “virtually visit”. It’s a wonderful way of engaging the children, as well as teaching them about other cultures and traditions – something I hope I can do one day with my son. Along with Sissi, Kristy has been one of the people I met in the very early days of my blogging and I’m honoured that she has taken the time to write this post for me today. Thank you Kristy – you’re in inspiration in your food and your parenting and a wonderful person! Enjoy the post everyone – I’ll be back in a few days with an original post, I want to say thank you to my guest posters Eva, Helene, Sissi, Nami and of course Kristy today – I hope you’ve all enjoyed the wonderful posts here! 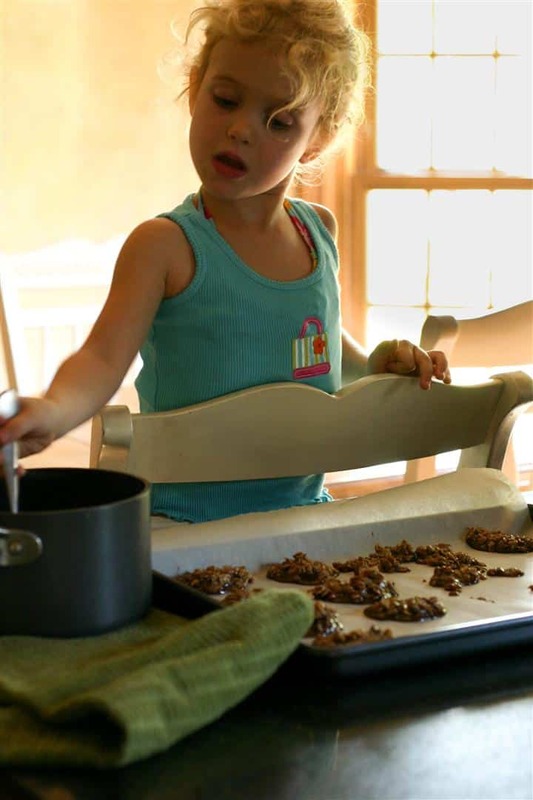 This is Kristy, Mike, Mr. N (8 years old) and Miss A (4 years old) and we blog our family food adventures over at Eat, Play, Love. We were so excited when Charles asked us to guest post – especially because of why Charles asked us to guest post. By the time you read this, Charles will be a proud new father and there are few (if any) more exciting things in life. We couldn’t be happier, and we know that Charles is going to make an amazing dad (and he’ll be backed by an equally amazing new mom!). Congrats to you both. We wish you and your family many beautiful, happy, loving and healthy years ahead (full of good eats too!). Family is a big focus on our blog which we began back in January 2011. 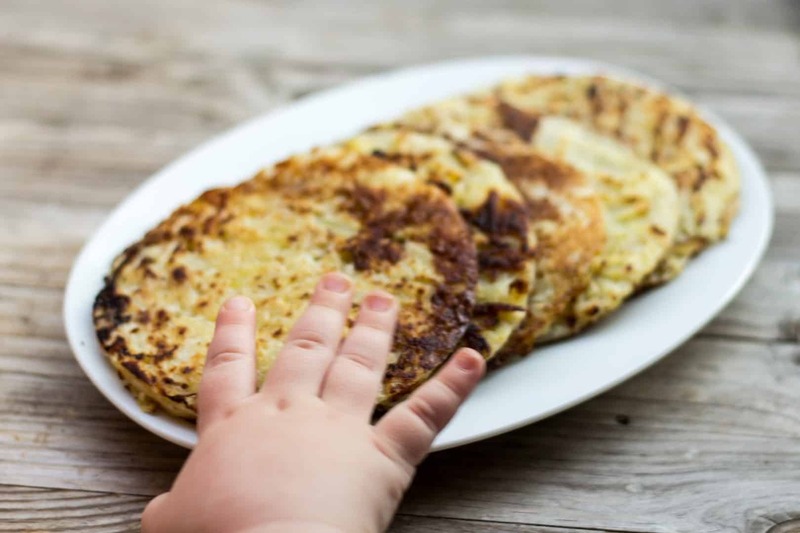 Our goal at Eat, Play, Love is to explore different cultures around the world with our children by cooking traditional recipes from different countries every few weeks. It’s our way of opening them up to the many different cultures, religions, and ethnicities around the globe while also expanding their palates. The kids participate in the country selection as well as the cooking which is always an adventure. For today’s recipe I wanted to pick something that was reflective of our home, traditions and family. I gave the dish a lot of thought and then it hit me. 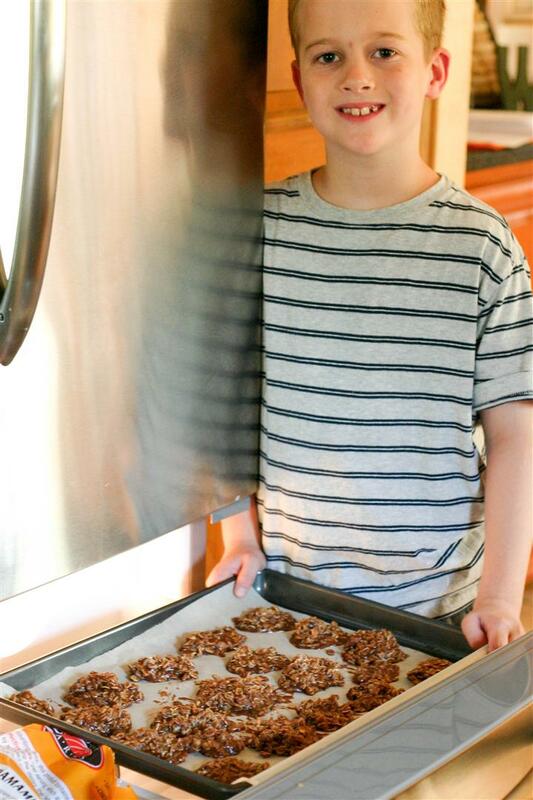 I have to share our recipe for No Bake Cookies. While it’s not a secret recipe, I’ve seen many versions floating around throughout the years, it is one that has been passed down for several generations. It’s a recipe which my dad made with his grandma and then with me. It then fast became one of my go-to comfort food dishes which I spent many a night making with my sister, my college roommates, post college roommates, coworkers and eventually with Mike. It seemed only fitting that I now get to share it with my kids, Charles’ family and all of you. Another perfect thing about this dish is that it happens to be chocolate. I know how much Charles loves chocolate; and Charles, well he knows how much I dislike chocolate. Yes, I am an anomaly. That said, this is the one and only form of chocolate I will eat, and one that I absolutely love to eat. So this one’s for you Charles. I hope it brings you as much comfort and as many memories as it does for us. 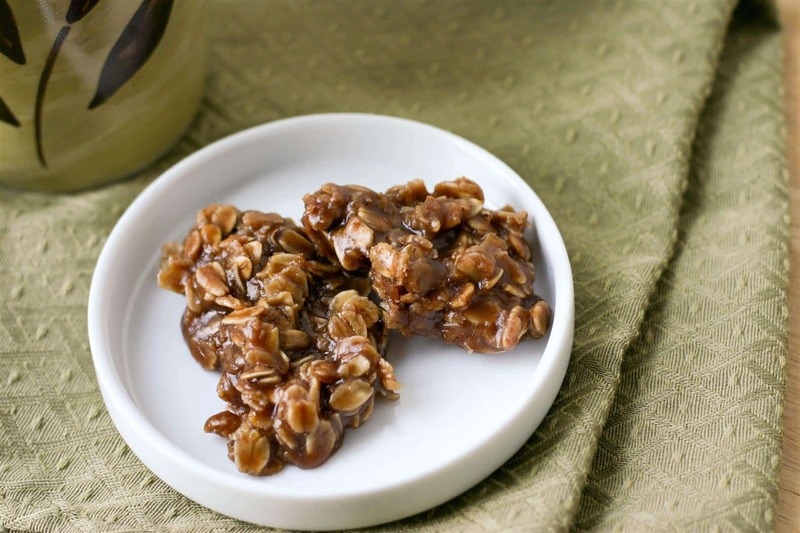 Now perhaps the best thing of all about no bake cookies is that they are derived from a simple recipe that can be whipped up in about 10 minutes, provided you have all the ingredients on hand (We always do as these come in handy for those craving dessert emergencies.). The recipe starts with a stick of butter (or 1/2 cup), sugar, milk and peanut butter. 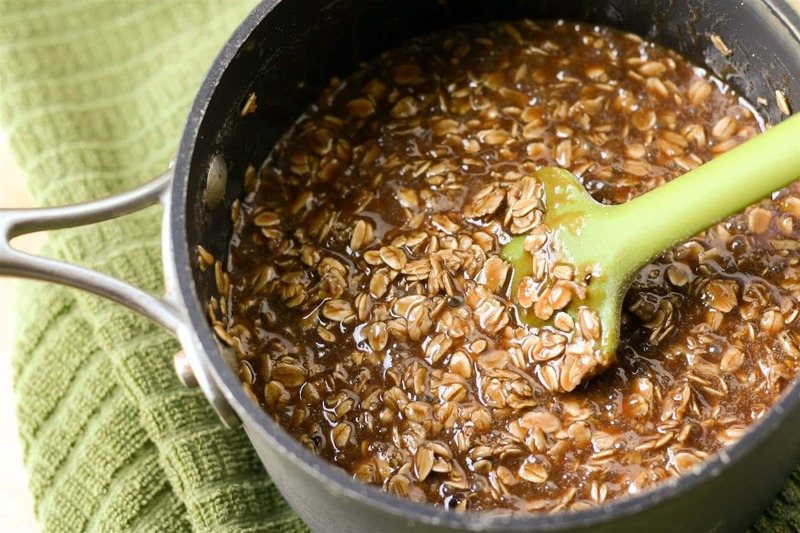 These four ingredients are melted in a saucepan over medium-high heat. 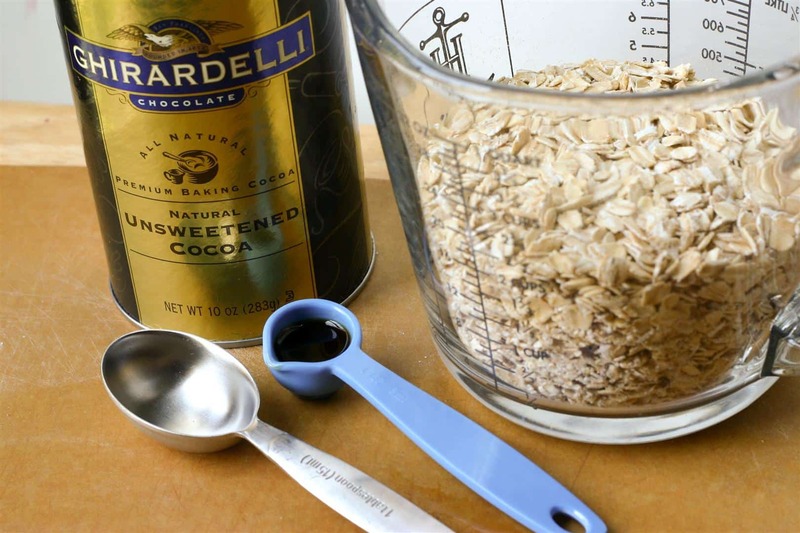 Next it’s time to gather the remaining ingredients including unsweetened cocoa, vanilla extract and oats. The heat is turned off and these final ingredients are mixed into the saucepan. Voilà! That’s it! The cooking is complete. See? It’s the perfect dessert emergency food. The only thing left is to scoop the mixture onto a parchment lined baking sheet. Miss A was ready to help with this part. She’s smart enough to know this comes with mandatory taste testing. And finally, it’s time to place the cookie sheet in the freezer (or the refrigerator works just as well). Now if this truly is a comfort food or dessert emergency, I have a little secret. Reserve some of the hot cookie batter in your favorite coffee mug or bowl, curl up in your favorite chair and dig into the hot, chocolatey, peanut buttery goodness. It’s sinful. It’s an overindulgence. It’s absolute heaven. I have these emergencies probably a dozen times a year. However, this little secret is only reserved for my quiet moments alone, or with Mike, after the kids have gone to bed. As for the kids…They’re not quite big enough to whip these up themselves yet, but they got to dig into the chewy, sticky delicious and chilled cookies. 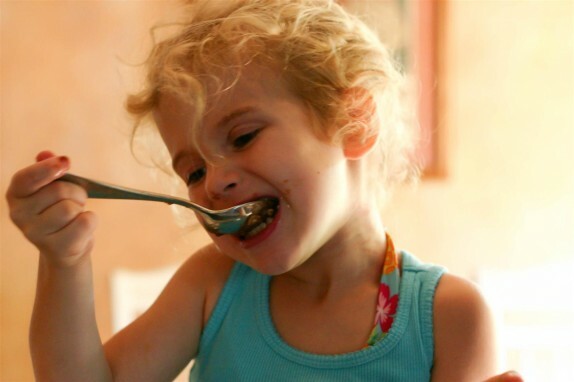 Before we sign off, it is a tradition on our blog to provide a spoon rating to each dish. Well, I think it’s fairly obvious this recipe gets the full ranking of 4 spoons from me. Miss A agrees with her mom, 4 spoons for her too. Dad and Mr. N love the cookies too, but not quite as much as us girls. They came in with 3 and 3-1/2 spoons, respectively. But no matter how you slice it up, no bake cookies are a great little recipe to have in your back pocket. It’s a family tradition which I suspect will be carried on for generations to come! Charles we hope you and your family enjoy this special recipe. Thank you so much for the honor of guest posting on FiveEuroFood. You are hands-down one of our favorite bloggers, and one of my favorite people I have come to know through this blogging experience. Thank you Charles and best wishes for all the days ahead. Hi again everyone, I hope you’ve been enjoying the guest posts from Eva, Helene and Sissi so far. Today I have another wonderful post from Nami, over at Just One Cookbook. I’m honoured to have Nami’s beautiful recipe and photographs here. The amount of effort she puts into her posts and presentation is enormous and the dishes she posts never cease to entice and amaze me. In addition to her wonderful food she recently took a trip back to her home country, Japan, and posted some great photos of her trip! I’m sure many of my readers will be familiar with Nami, but in case you’re not, do go and check out her wonderful site. Nami concentrates on, as she says below, “quick and easy Japanese home cooking” and you’ll always be able to get some great ideas from her. Over the months that I’ve been reading Nami’s blog I’ve learnt techniques, tips and ingredients which not only I’ve never tried before, but some of them I’d never heard of – maybe I’ve been living under a rock, but I’d never heard of matcha until I started reading Nami’s site. I hope you enjoy the beautiful post today, I’ll be back in a few days with an announcement, and then after that another great guest post! Thanks everyone! Greetings everyone! 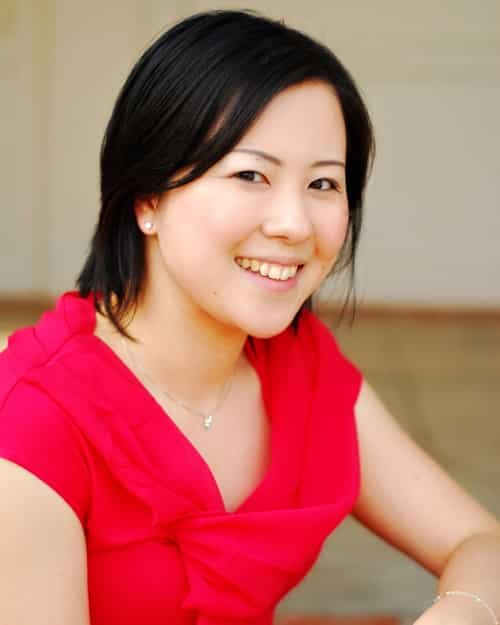 My name is Nami and I share quick and easy Japanese home cooking at my blog, Just One Cookbook. I’m here today to blog sit FiveEuroFood while Charles is busy with his commitments away from his site. 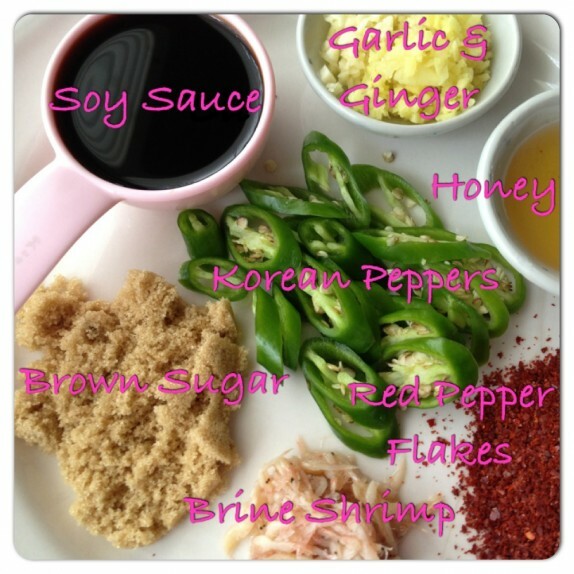 I’m honored to be here and share my recipe with you, and I hope you will enjoy my post. 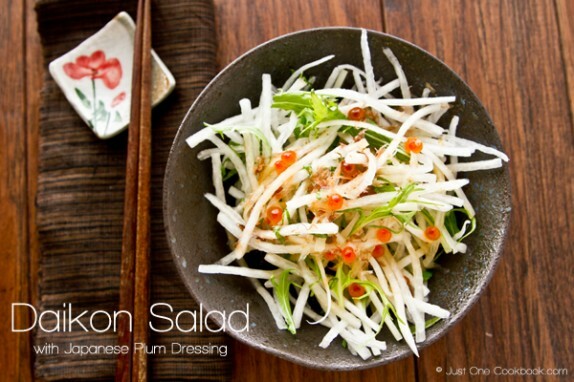 I prepared a very refreshing salad using Japanese radish called daikon. Daikon is a mild flavored, very large, white radish, and it’s often used as garnishing of sashimi or grated and served with agedashi tofu or tempura. 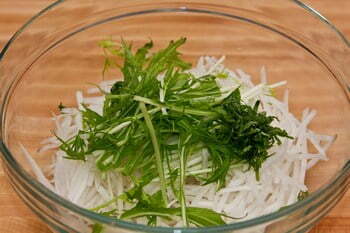 For this salad, I shredded daikon into long thin strips so that it gives a nice crunchy texture while you eat. Daikon is widely available at Asian markets and sometimes even in Western supermarkets in the US. To pick a good daikon, just make sure the inside looks juicy and not dry. If you are also able to get organic daikon, I highly recommend it since the flavor is much better than conventional ones. As for the salad dressing, I used my favorite dressing base – ponzu sesame vinaigrette, and this time I added umeboshi. 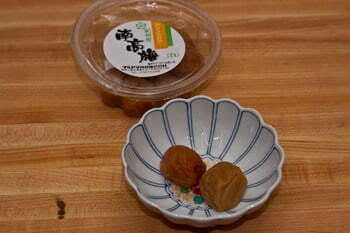 Umeboshi are salted pickled Japanese ume (plums). They are a common ingredient for onigiri (rice ball) and you might have also seen a single umeboshi placed in the center of the rice inside a bento (Japanese lunchbox). 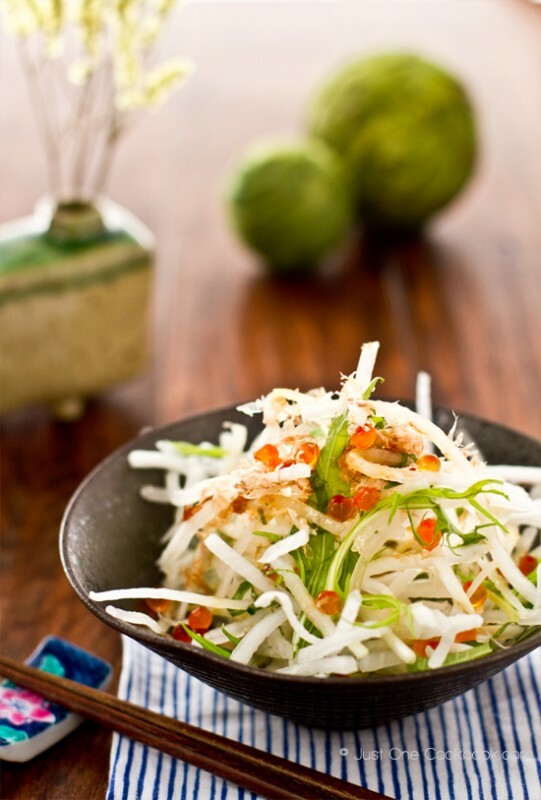 The salty sour flavor from umeboshi adds a nice kick to the dressing. If you cannot find umeboshi, don’t worry, you can still use this ponzu sesame vinaigrette for the recipe. 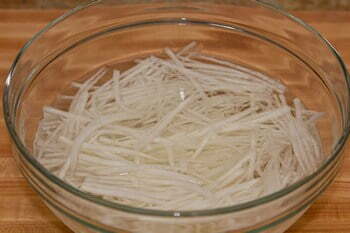 Ponzu is a citrus-based soy sauce and it’s used as a dip for Shabu Shabu and sashimi, or used as a dressing. I hope you enjoy this post and will give this salad a try one day. Thank you Charles for allowing me to share my recipe with your readers. Now let’s start cooking! 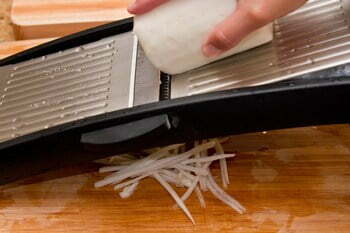 With a mandolin slicer, shred daikon to thread pieces. 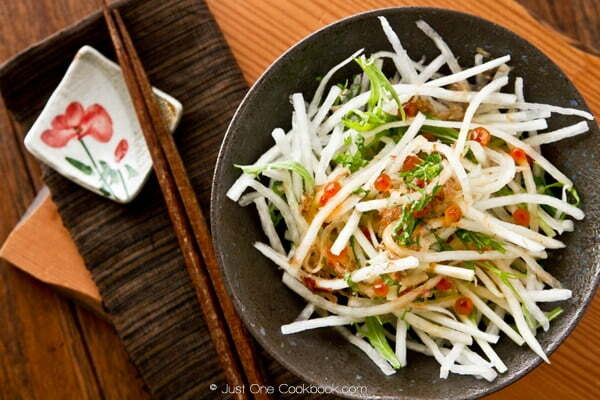 Soak shredded daikon in cold water for 5-10 minutes to get the crunchy texture and get rid of the bitter flavor. 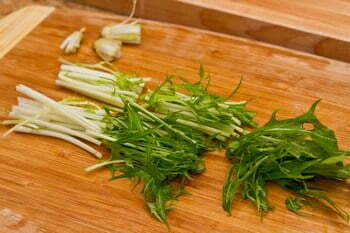 Cut mizuna into 3 inch lengths. Combine all the salad ingredients in a bowl and toss it all together. Remove the seed from umeboshi and chop into small pieces. 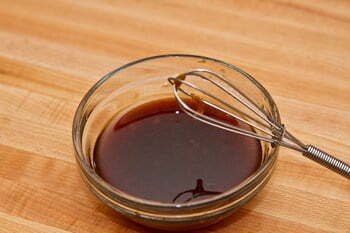 Combine all the dressing ingredients in a small bowl and whisk all together. Serve chilled. Sprinkle katsuobushi (bonito flakes) and ikura (salmon roe) if you like. Pour the dressing when you are ready to serve. Enjoy!